The tenant can transfer her interest in the lease by assigning or by subletting. In an assignmentThe tenant transfers all interest in the premises, along with all obligations., the tenant transfers all interest in the premises and all obligations. Thus the assignee-tenant is duty bound to pay the landlord the periodic rental and to perform all other provisions in the lease. If the assignee defaulted, however, the original tenant would remain liable to the landlord. In short, with an assignment, both assignor and assignee are liable under the lease unless the landlord releases the assignor. By contrast, a subleaseA transfer of something less than the entire leasehold interest. 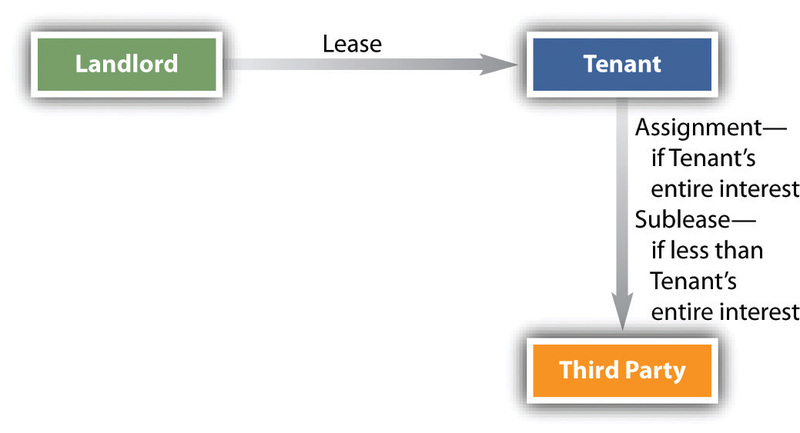 is a transfer of something less than the entire leasehold interest (see Figure 13.1 "Assignment vs. Sublease"). For instance, the tenant might have five years remaining on her lease and sublet the premises for two years, or she might sublet the ground floor of a four-story building. Unlike an assignee, the subtenant does not step into the shoes of the tenant and is not liable to the landlord for performance of the tenant’s duties. The subtenant’s only obligations are to the tenant. What distinguishes the assignment from the sublease is not the name but whether or not the entire leasehold interest has been transferred. If not, the transfer is a sublease. In Chapter 11 "The Nature and Regulation of Real Estate and the Environment", we discussed the tort liability of the owner or occupier of real estate to persons injured on the property. As a general rule, when injury occurs on premises rented to a tenant, it is the tenant—an occupier—who is liable. The reason for this rule seems clear: The landlord has given up all but a reversionary interest in the property; he has no further control over the premises. Indeed, he is not even permitted on the property without the tenant’s permission. But over the years, certain exceptions have developed to the rule that the landlord is not liable. The primary reason for this change is the recognition that the landlord is better able to pay for repairs to his property than his relatively poorer tenants and that he has ultimate control over the general conditions surrounding the apartment or apartment complex.